The design of today's semiconductor chips for various applications, such as telecommunications, poses various challenges due to the complexity of these systems. These highly complex systems-on-chips demand new approaches to connect and manage the communication between on-chip processing and storage components and networks on chips (NoCs) provide a powerful solution. This book is the first to provide a unified overview of NoC technology. 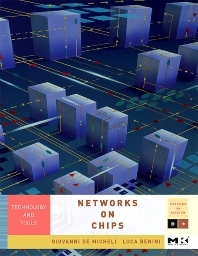 It includes in-depth analysis of all the on-chip communication challenges, from physical wiring implementation up to software architecture, and a complete classification of their various Network-on-Chip approaches and solutions. Primary: Researchers/Practitioners in Multiprocessor Systems on Chips; Networks on Chips. VLSI design companies (ST Microelectronics, Arteris, etc.) involved currently with implementing NoCs on silicon. Secondary: Graduate-level courses in System on Chip design.